Each sale contributes to survival of the honeybee and their essential work in pollinating over 70% of our world’s food crops. 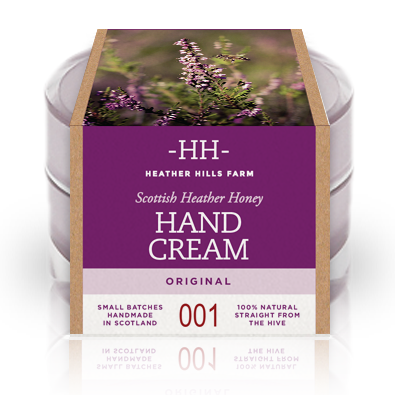 A luxurious, super rich and intensive conditioning 100% natural hand cream enriched with raw Scottish Heather Honey to nourish, heal and hydrate the skin. 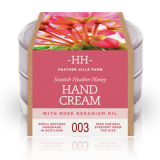 Formulated with natural emollients such as Mango Butter, Coconut Oil and Rosehip Oil to soothe dry, damaged skin and reduce the appearance wrinkles, pigmentation and scars. 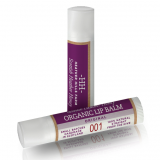 Fortified with Cranberry Seed Oil, Wheatgerm Oil and Olive Leaf Extract to provide a natural blend of Omega 3, 6 and 9 essential fatty acids and Vitamin E which are crucial in skin development and the prevention of wrinkles. 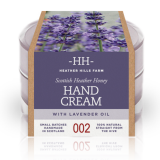 A beautiful, rich aroma of Scottish Heather Honey. A little goes a long way! Ingredients: Aqua, Triticum vulgare (Wheat) Germ Oil, Rosa canina Fruit Oil, Glyceryl Stearate, Cetearyl Alcohol, Cetyl Alcohol, Mangifera indica (Mango) Seed Butter, Cocos Nucifera (Coconut) Oil, Glycerin, Olea europaea Leaf Extract, Vaccinium Macrocarpon (Cranberry) Seed Oil, Anthemis nobilis Flower Extract, Mel (Honey), Stearic Acid, Citrus sinensis (Sweet Orange) Oil, Lavandula angustifolia (Lavender) Flower Extract, Panax ginseng Root Extract, Symphytum officinale Leaf Extract, Alcohol Denat., Benzyl Alcohol, Dehydroacetic Acid.